This is one of those books that I always hear everyone raving about. When the audiobook came up as Sync title I enthusiastically downloaded it. I was a little apprehensive because it is a longer book, and therefore audiobook -- could I make it through 12 hours of the same story without going crazy?! This book deserves every bit of praise I have heard about it. It is honest and empowering. I really grew to admire Ismae. She was a good student and a good pupil of the convent, but she also had the smarts to step back and think for herself. It kind of reminds me of the cover of Breaking Dawn -- yes, I did just throw in a Twilight mention. Once a Twihard, always a Twihard! But the cover of that book is a chess board and Stephanie Meyer has said that it shows how Bella, who was the weakest character at the beginning of the series, is now the strongest. Ismae is similar. In the beginning she is not valued by her father or husband. By the end, she is the one calling the shots in her life and love. Great action, great pacing, great romance, great setting. This book gets 5 of 5 stars from me. Poor Annith! I really hope we hear more about her in Book #2. I can't wait to read Book #2, by the way -- I am so curious to see the world through Sybella's eyes. Yeah, true story!! I can see why you flew through it! I can't say enough how much I enjoyed this book and can not wait until the sequel comes out. Anyone who enjoys traditional fantasy novels but wants something a little less intense and slightly more Young Adult should give this book a go. 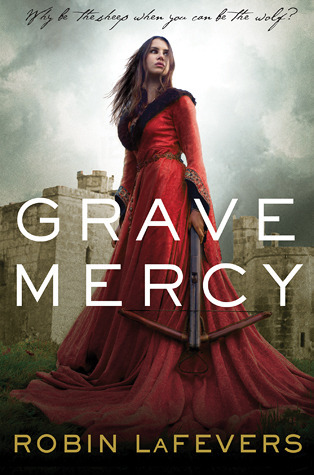 Grave Mercy is my new go to book now when people ask me for book recommendations!